Are you looking for cheap Bluetooth headphones that sound good the price and many kinds of music, movies and games? It is not easy to find a Bluetooth headphone that sound decent for under $50-I mean for casual or entry-level listeners because there are thousands of them. But if you have decided which type of headphones you are going to buy, Bluetooth earbuds, true wireless earbuds, over ear, around the neck and on ear, here we narrowed down the list of best possible picks for your expectations: battery life, sound quality, Bluetooth connection, features, design and price. This pair is the upgrade of Anker SoundBuds Slim. This latest version has a better battery and sound quality the design is almost the same. The Slim+ has great the build quality for the price, the cable is strong, and earbuds are rugged and metalic. Designed with sport mind, the Slim+ features earhooks and sweat-resistance. Earbuds are easy to fit with variety of eartips and hooks, the cable can be managed by clip if you move around. And they can magnetically clip together in a nifty way around your neck. Creative Sound Blaster Jam: Solid sound for an old school headphone. Creative Sound Blaster Jam doesn’t look polish but its quality build, cheap price and good sound quality make it easy to stand out. The battery of Blaster Jam is 12 hours the sound is clear and energetic. The bass is also a plus point for this headset. There are a few flaws. On of which is plastic headband, no padding not so it won’t be comfortable. The headphone also doesn’t work well as a headset because the mic doesn’t filter out the ambient noises. Large earcups, listening music and watching movies privately are among factors people love over ear Bluetooth headphones. Most importantly, these types of can are able to hit the low-end that can improve your mood, the sound that is energetic, dynamic and rumbling, it is not easily heard from other types of headphones. The Mpow 059 takes all the advantages of over ear can and it is exceptionally comfortable for most head sizes even for those with large head, and the comfort can last for hours. Overall build quality is great for the price. The paddings are superb soft, which as advertised mimics the human skin texture. The Mpow 059 is a Bluetooth headset that you don’t have to charge everyday. It has a strong battery life, which lasts up to 20 hours between charges. If used with Bluetooth transmitter, you can enjoy quality audio while watching movies on TV without disturbing others. It sounds dynamic with strong, rich bass and for calls it is just funtional as a good headset. Though this can got a huge positive reviews, critics rated it just as an average Bluetooth headphone for the build quality, comfort and sound quality. Because this can’s sound is not well-balanced, it focuses overly on bass. This intention makes other ranges feel laid-back and lack in detail. But that’s said if you are just need a can that can work for everything, Mpow 059 will be worth it. Around the neck, neckband or behind the neck, you name it, these type of headphones have been well recognized recently for their functionalities. For the price range, we don’t find any pair that sounded great, just a bit difference in sound quality, what really set them apart from each other is the style. We would recommand Jabra Halo Smart Wireless, Skullcandy Ink’d, LyreBeats-NB1 or Samsung Level U. While one may have a better sound isolation than others, its battery may be less. Sports headphones that powers your working out. With average battery ranged from 7 to 8 hours, those cheap neckband Bluetooth headphones can be used for your commute and work. The headset function is good enough for calls in your office. This post was originally published in 2014, a lot of revises have been made, we hope you always get best information on this post to find your headphones. Bluedio Turbine T2 can rumble but the the paddings are easy to wear out. The volume buttons positions right on the R-earcup. Just touch and press (-/+), but you have to press it firmly. The power button is conveniently beneath the volume controls, press and hold it for a few second, a LED indicator will turn blue to indicate it is available for pairing. Scan this headset from Bluetooth setting on your device, Bluedio is about to connect. The padding on earcups are really soft and provides a good noise isolation. I don’t know how long the paddings will last (it is not replaceable). When Bluedio T2 plays at moderate volume level, it’s hard for me hear people chatting around. The Bluedio also features a mic and volume controls, enabling you to pick up calls and make calls. When someone calls you, there is a women voice that says “In-coming call,” you can pick the call by pressing the power button. The voice call quality are quite good. When I walk away from my phone, about 7 or 8 m, the sound starts to to have hiccup. So I guess the real working range is around 7 m to ensure the sound is just fine and the headset is in a stable connection. In addition, it has a nice feature that when you disconnect your device from this headset, it will automatically shut off. The Bluedio package includes the USB charging cable and a cable for audio output if it run out of battery. No carrying case is included. After un-boxing, I let it play continuously for many kinds of music. I have been using it for 3 days. Undoubtedly, it sound good for R&B or dance. Of all sub-$50 Bluetooth headphones we’ve listened to, including Photive BTH3 Bluetooth 4.0. The Bluedio T2 sounds decent, with relatively warm, pleasant sound for Bluetooth. The sound is spacious too. There’s a 57mm HFP Driver in each ear cup, and the Turbine T2’s Impedance is listed 16Ω. These specifications do tell you something about the bass that was quite powerful and dynamic, but in fact when playing Radio Active, I found the low bass a bit distorted, I could say “flabby”, but doesn’t mean loose or out of control. I switched to Game of Thrones soundtracks, they sound great, thinking of watching the next season using this headset. The treble is crisp and clear-not astonishingly bright. Mid range represents warm sounding. 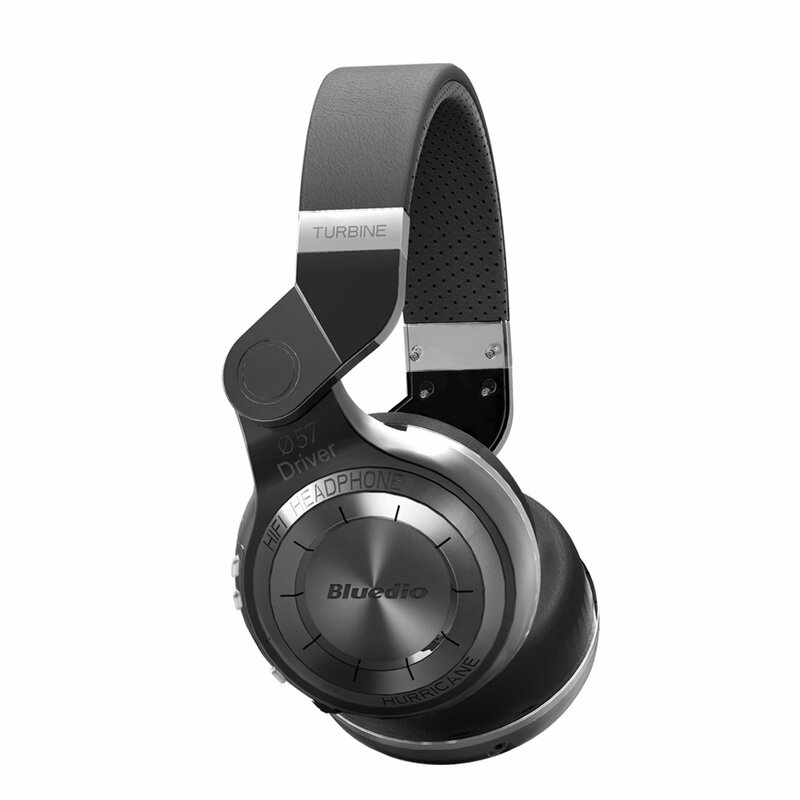 While it is not that much to talk about its weaknesses, the Bluedio T2 is a great budget Bluetooth headphone for what you can enjoy from your tablet or phone without cable–for watching movies, listening music and playing games. Shop Now: $29.99 at Amazon and $26.67 at GearBest.com. Best over ear headphones under $50. I was surprised that there is no Anker Bluetooth over ear headphones. The Anker SoundBuds Slim + sounds “tiny” won’t feel rumbling or full what’s wrong with those Bluetooth earbuds.